A-hem. If, for you, alcohol is the devil’s brew, then please avert your eyes. For today’s post deals with wine and cocktails, and specifically, the kind of glassware from which they ought to be served. Plastic cups are forbidden, of course, unless you are as young and foolish as I once was, and your idea of fine wine is a bottle of Blue Nun. The Blue Nun in question. I drank it simply because I did not know any better. Also, the label was a beautiful shade of blue. Today, I love to invite friends over for drinks and nibbles. The food is really easy to prepare, and everyone — including the host! 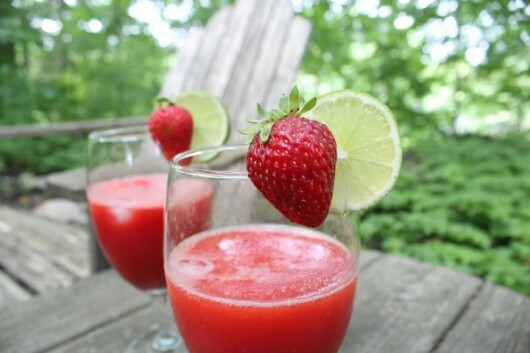 — gets to mix, mingle, and relax with a glass in hand. Red wine goblets. These have large, balloon-shaped bowls. The design permits the swirling and aerating of Cabernet Sauvignon, Syrah, Pinot Noir, and other red wines. You can find such glasses at better kitchen-supply stores, or purchase them in sets from Amazon. 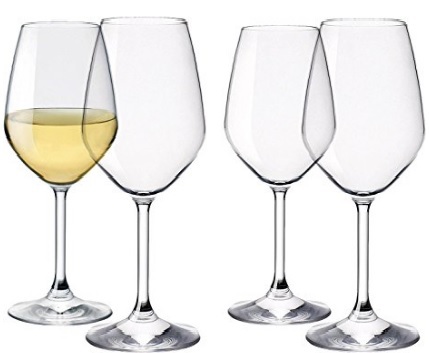 Unlike their red wine colleagues, white wine goblets have a fairly narrow bowl and an extra-long stem. The small surface area slows oxidation of the wine, while allowing its subtle scents (a/k/a “notes”) to escape upwards towards the nose. White wine glasses should always be held by the stem. Otherwise, your hand will warm the wine. Pictured above: a set of 4 Paksh Italian White Wine Goblets, $19.95 from Amazon. Champagne flutes have a long, narrow body and a tiny mouth. Confined this way, bubbles do not dissipate too quickly. (Who wants flat Champagne or Prosecco? )Flutes are inexpensive and easy to find at department stores and kitchen supply stores. A set of 12 can be had for just $39.95 at Amazon. The famous V-shaped cocktail glass is a must-have for my own favorite drink: the martini! The broad surface area lets you inhale the exquisite herbal aromas released by good gin. The best cocktail (martini) glasses are designed with a 4 1/2-inch mouth. You can buy them in sets of 4 for $19.99 from Amazon. High ball glass. I use this tall tumbler for Bloody Marys, mojitos, and other drinks that are poured over ice.They’re great for iced tea, too. Crystal high balls — 4 to a set — are available for $24.95 from Amazon. 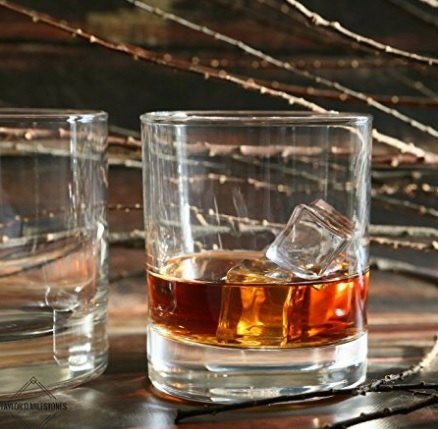 The low ball glass is for bourbon, scotch, whisky, and other alcoholic beverages that are served either neat or on-the-rocks. The glasses are designed with a weighted base for “muddling” (the pounding of mint leaves or other ingredients with a spoon or pestle). 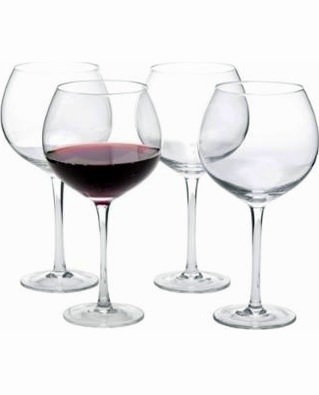 Pictured above: USA-made low ball glasses, a set of 2 for $21.95 from Amazon. And what about stemless wine glasses? I own two sets of these but rarely use them. Keep in mind that stems are not meant to be decorative. They provide a way to hold a glass so that hands do not affect the temperature of the wine. Alrighty then. I hope you enjoyed this short post. If you’d like some advice on how, exactly, to host a cocktail event, just drop me a line in the comments field below. After all, I want you to be a guest at your own party! Wonderful post! Though i must admit, my cocktail hosting efforts are few and far between, since “isolation” and the lack of a regular social circle are issues i struggle with. That said, hubby and i do have a wine glass that’s our favorite – Schott Zwiesel glassses. Costly, but durable. I even put them in the dishwasher! Hi Barbara — I’d like to find friends that I can put in the dishwasher. (Just kidding!) Actually, building a guest list is a great idea for a future post. Thanks for the inspiration! I enjoy a casual gathering of good friends, satisfying wine & tasty nibbles. What delights do you prepare & enjoy at such gatherings? It would be wonderful to add some of your tasty recipes. 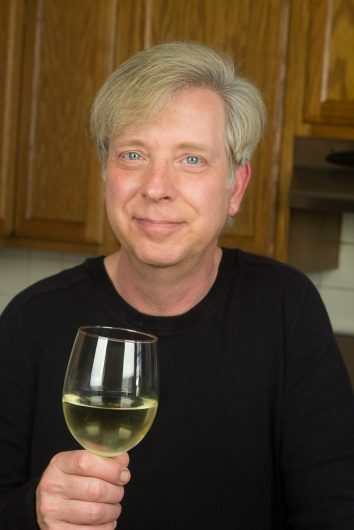 Hi Amy – Click here to see my make-ahead appetizer recipes. Enjoy! I drink everything from blue cut glass goblets and tumblers, vintage from the 1970s, and found at garage sales. My boyfriend thinks I’m a heathen, but I feel like a queen. Besides, my prosecco never has time to go flat! My husband and I being young, poor, and naive thought blue nun was great in our early twenties. We have moved on to more refined wines, but I laughed out loud when I saw the bottle! Oh youth! Loved all the glasses your chose! Thank you for the delicious recipes. I’m so excited. I shared your radish recipe the other day, but have yet to enjoy. As always, your charm, wit and knowledge are delightful. 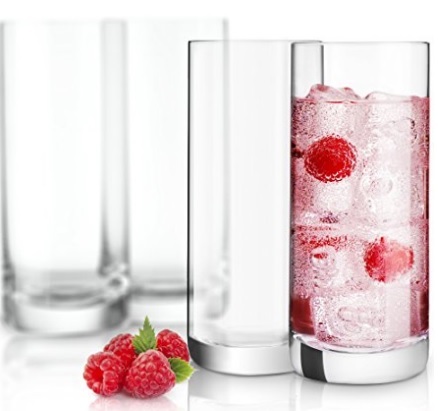 Do not overlook bargain stores like Marshalls or Home Goods or even Marketplace at Ikea for barware or glasses. I love bubbles and have Waterford flutes but they are not my ‘go to’. With outdoor entertaining so popular, I found perfect flutes at IKEA for $2.50/flute. Lovely for mimosas too. If one breaks, no worries. Glassware is terribly important, both for the drink and the guest. Avoid faux pas ! Which drinks and nibbles do you serve at a party? Ha! I drank Blue Nun as a very young adult also. Your post brought back some fun memories! Thanks for walking us through the glassware section at Chez Kevin! Your profile picture proves that you apply these exacting standards in real life. 🙂 Lovely! I just hate to drink good wine at friends’ houses because it spoils me for my usual house wine, Chateau Plenty. Choice of glass wear-large. Hi Kevin, I don’t drink but I’ve always wondered what glass for what drink. Thanks for solving this one for me. Love your posts. You brought back memories of my fun filled very young days when my friends and I enjoyed Thunderbird wine. $1.00 a bottle. I date myself. 18 was the legal drinking age. I make wine – so having the correct stemware is of the utmost importance. I’ve been tossing around the idea of hosting a wine tasting patio party. I think make ahead ‘hor’s’ would be an excellent idea so I too can enjoy the day. Thanks Kevin – you ROCK! Thanks for the post- my issue it a small kitchen and lack of storage space for all the variety of glasses. I wish I could find more space. I will have to see what I can clean out so I can store more glasses. I love all the food and party info but I am more a gardener at heart and I miss the garden when you are off in the kitchen cooking. When I was twenty-three, long long ago, someone handed me brandy in a snifter. I nearly passed out from the fumes and could not drink it! What is the proper glassware for aged port? Great post! I admit to being lost on the topic of proper glassware for different alcoholic drinks. So, this was a valuable tutorial. Always look forward to your posts! Thank you for the informational class on proper glassware for alcoholic drinks. I like these kind of posts. Enjoyable and learn something at the same time. Hi Kevin, very helpful info on the glasses….makes perfect sense, and easy to remember. BTW, your new haircut looks fabulous! Great post on size glasses. I hate the new stemless glasses because I don’t like getting the wine hot from my hands. We took a wine tasting class paired with food and were told that about the stems. This was in the 80’s before the stemless got popular. As a natural born clutz when it comes to stemware, I love the stemless glasses for wine. I try to remember not to fondle them between sips. Lovely, informative post as usual, Kevin! BTW, my “younger days” wine of choice was Mateus. Depending upon my mood, when it’s just me and my dog Sophie, I actually use my Waterford – the younger generation doesn’t t value it – so, if it breaks – I have treated myself special. I have decided not to save any of my ‘good’ china, crystal, silver for another generation. I use my fine china daily, mix and match with chunky handmade pottery and guests think it is the greatest. Bookclub will be in my backyard in July and the Waterford, Pickard, Lenox will be used as well as a mix of local artist pieces. We are all worth it!! Plaid and lace tablecloths also. The book discussion will be rich and lively after a round of wine, gin & tonic, mojito’s – you can be sure. Hopefully the rain will have ceased by then – we are 10″ over normal rainfall already and it’s still May. So soggy!!! Garden struggling, lawnmowing endless. Baby kale, baby spinach, radishes are thriving and delicious from the garden. Have a great summer everyone. LOL – We drank Blue Nun back in college for the same reasons! Love your blog. Covet your beautiful home. Years ago I started a collection of flutes that I purchased two by two. Today when serving Prosecco the mix and match flutes look beautiful on a silver or bamboo woven tray, depending on the occasion. And for klutzy friends, the European wine glass (really a wider juice glass) is perfect to avoid knocking over stemmed glasses! Thanks again for info so many need. I also have a collection of cordial glasses, sherry glasses, and German hock glasses. Such fun to use! Great post, but I’m curious as to why you credit Amazon to your where-to-shop? What about a small, independent shop that ships throughout the country? Hi Kevin. My favorite drink is champagne. I like the glass that is wide and short, but I don’t know what they called. Can you tell me, please? My husband likes the flute style. I collect my glasses from second hand/antique stores. 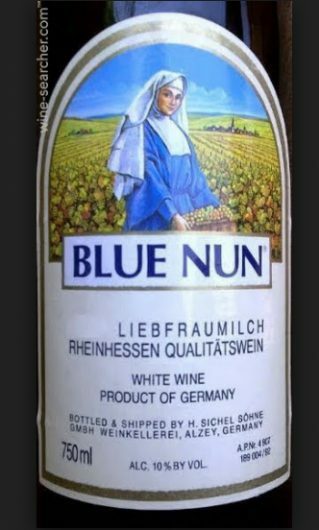 Blue nun would’ve been a step up for me, we usually drank strawberry hill or Ripple. Oh, the headaches! In Italy, the older people drink lots of wine from small juice glasses. I copy that when I’m home by myself. It’s not in the glass long enough to change temperature ! 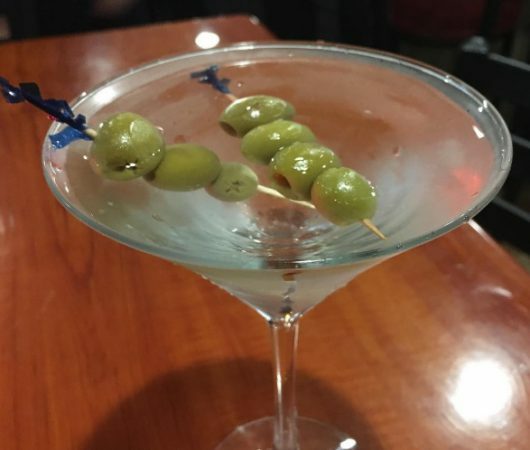 My favorite libation is a gin martini with lots of olives, and the photo of yours looks perfect! Will you share your recipe? I agree with Patty that your new photo looks terrific! Like everyone else, I’m looking forward to your cookbook. Thanks for the refresher on barware. I also love wine in stoneware..temperature stays cool despite the lack of a stem. Glad to give an angel or two some wings! Having friends over for drinks and snacks is something we enjoy at our house, and we have a fully stocked bar to prove it. Fun times! What about after dinner drinks? What kind of glass for brandy, cointreau etc.? Just was introduced to you through a friend on FB. Signed up for your newsletters. Read about the proper glasses for alcoholic drinks. Had to smile….martini Maureen here! Love them! We already have something in common! And can’t wait to use vinegar on my weeds. Already use for laundry. Hi Maureen – Vive le martini! Love this post! And this will date me, but I started drinking right at the time that white zinfandel became a thing and loved it. Now all I can think is YUCK! My mother, so sweet, gifted us a bottle of it when we bought our house in ’95. We kept it in the fridge as a keepsake for years before we finally poured it out. I know it’s blasphemous, especially considering how much we spend on some of our libations, but we just don’t have the room for different glasses. Also, I bought some nice Riedels years ago and managed to break them all within months. Ikea for me, now! Thanks for your blog; I’m a relatively new reader and just love it!